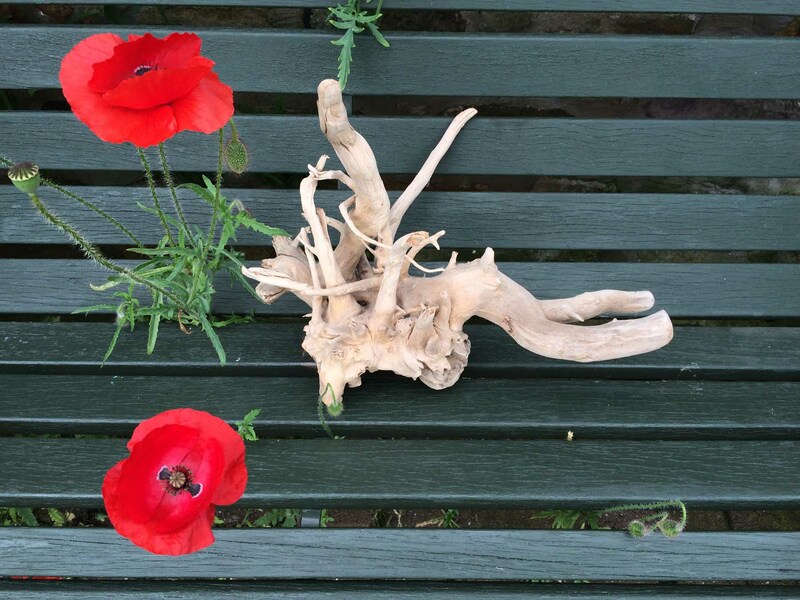 One of the great, great pleasures of living by the sea are the treasures you find on all those everyday beach walks. 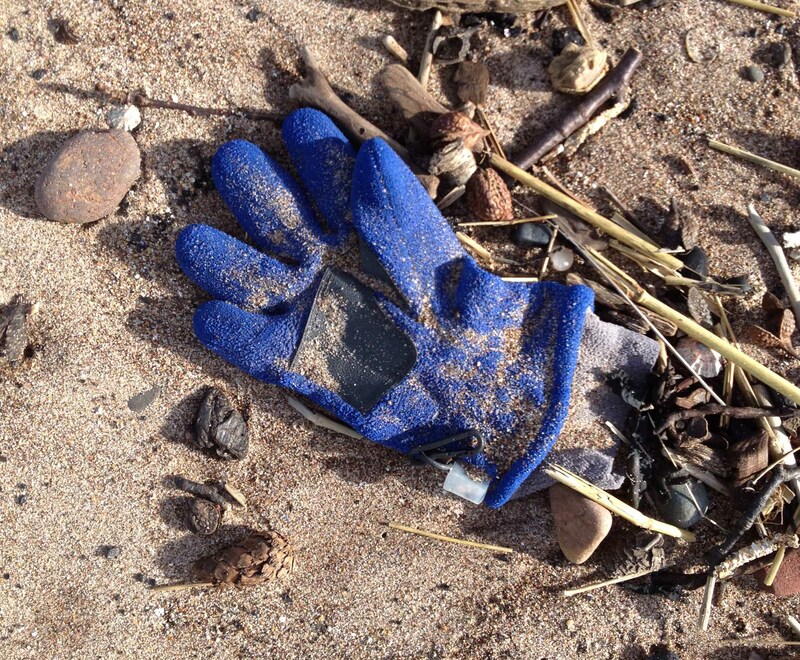 All sorts of things get washed up on the beach. 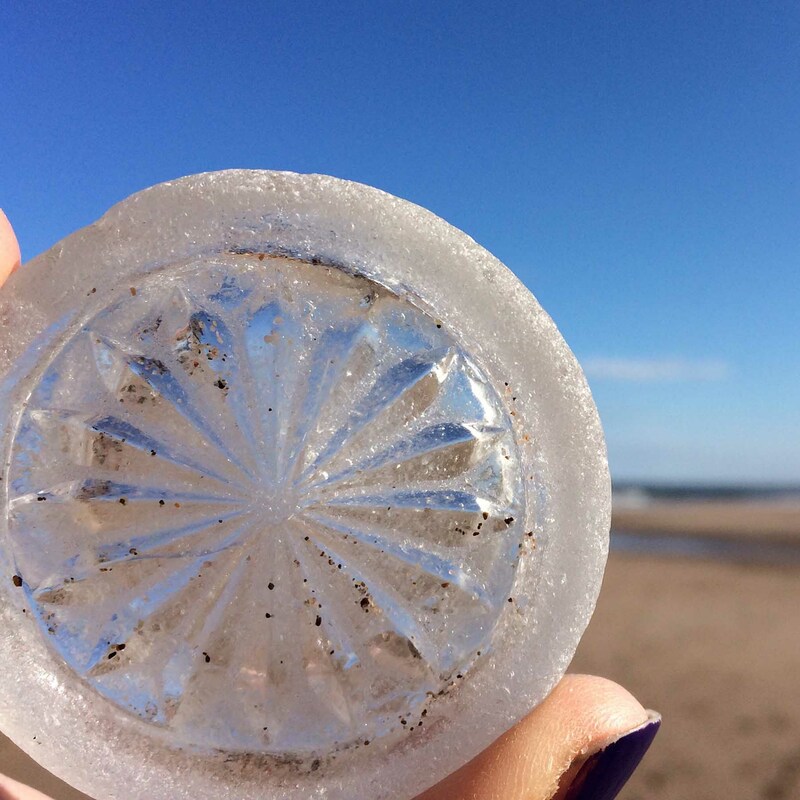 It doesn’t necessarily take a storm out at sea for us to find intriguing objects on the beach – but it helps. We find so many odd shoes! And bare legs too! 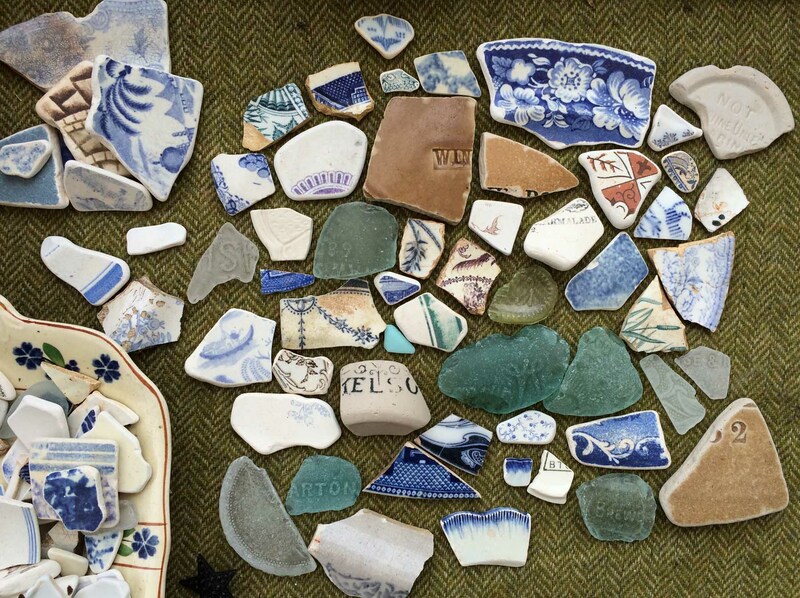 You can’t help wondering about the stories behind these finds. 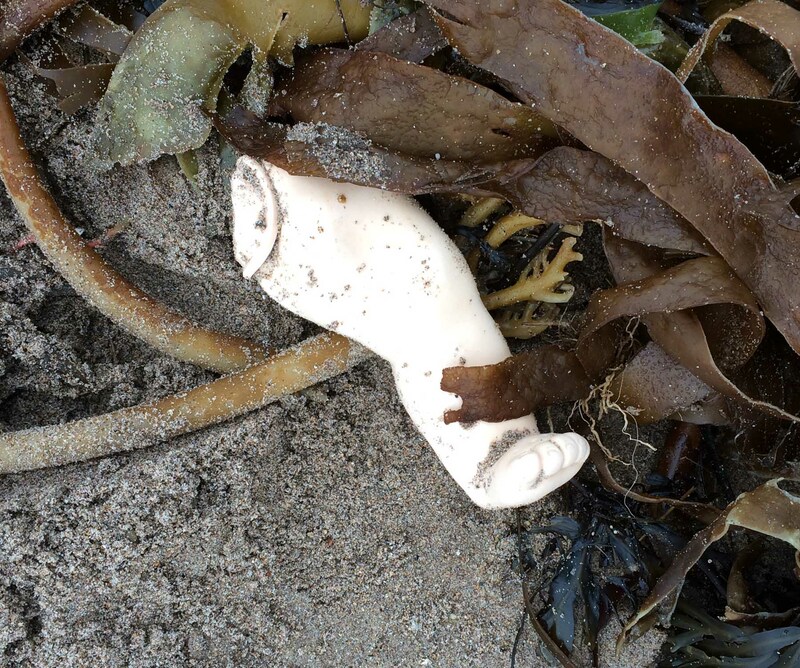 Were there hysterics when the doll’s leg got washed away? 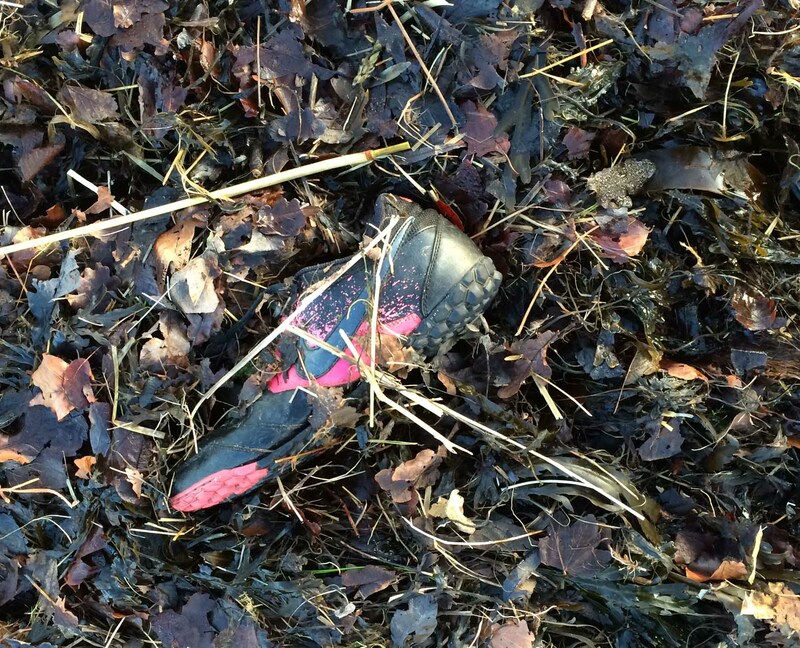 Furious parents because a teenager had lost one of a new pair of trainers? Was this vegetable meant for Sunday lunch? 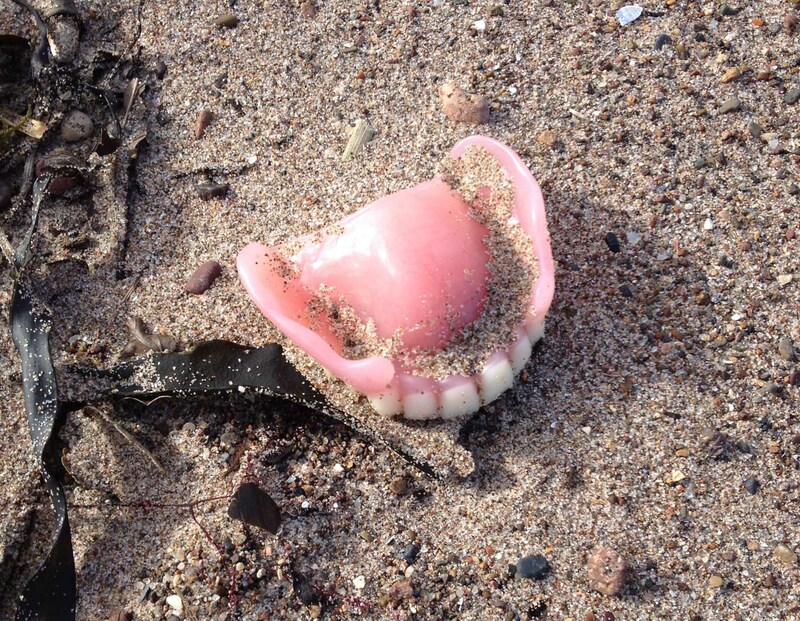 We couldn’t believe it when we found false teeth on the beach! – how on earth?!!! But were somewhat shamefaced when we recounted this story to my aunt, only to be told it had happened to her once…. oh dear. Some finds are more disturbing. 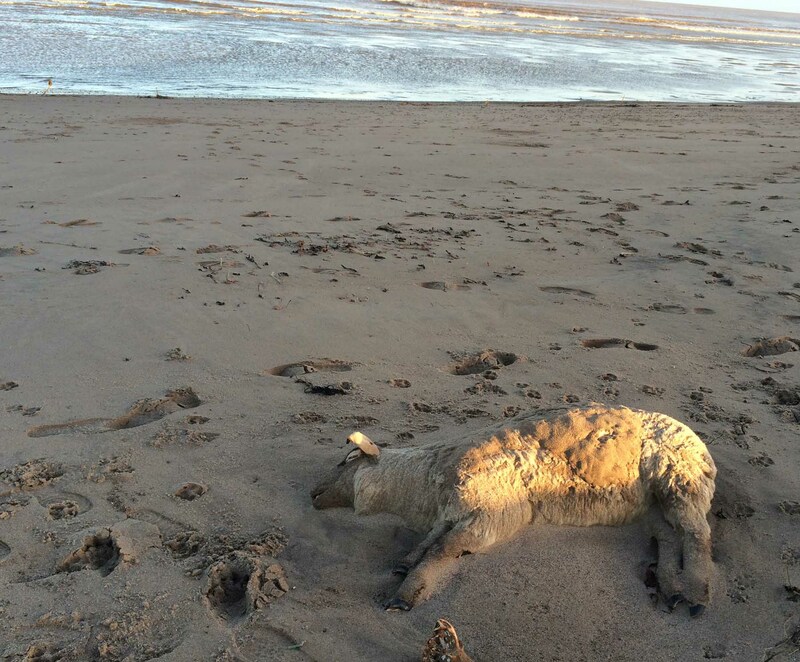 After the terrible floods last winter, we found several dead sheep on the beach, washed down the river Tweed. 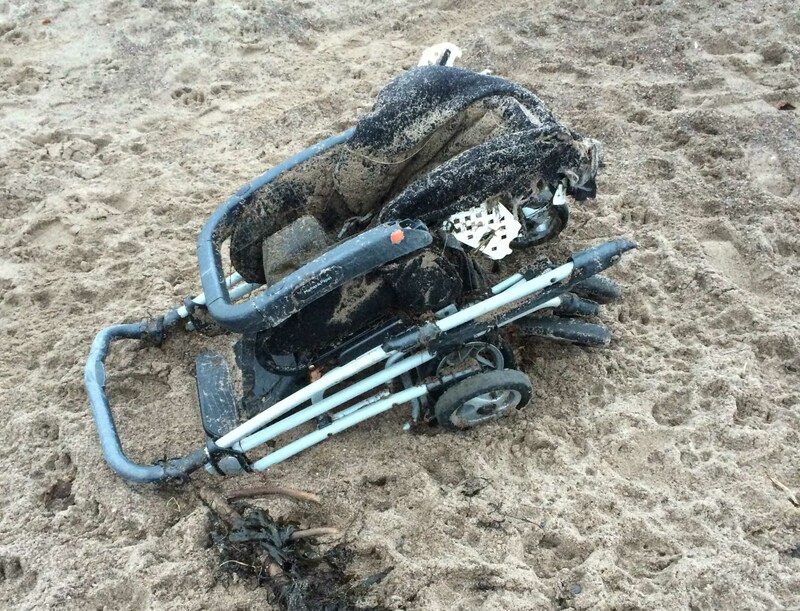 A pushchair – was this a terrible accident, or just lazy parents who wanted to dispose of an old broken one? 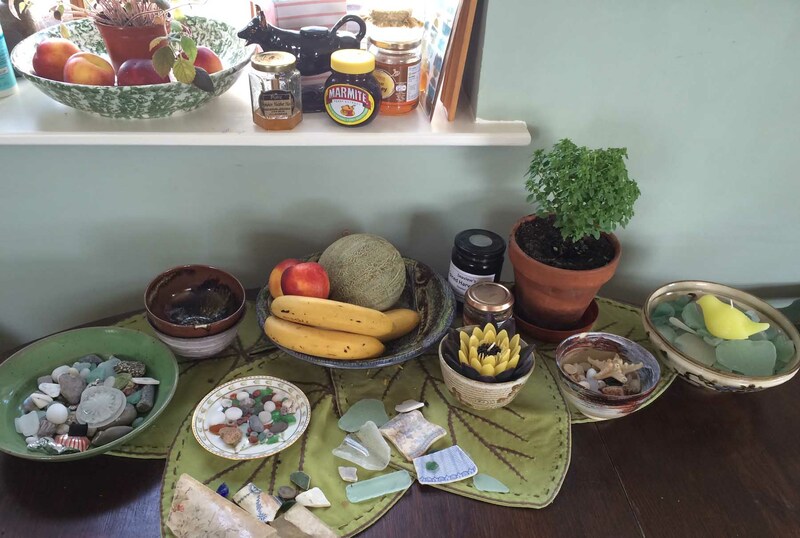 Some things come back with us, and we have a “nature table” display on one of the window sills in our kitchen specially dedicated to these finds. Yes, those are the teeth! Three baby dummies, would you believe it? And all sorts of children’s toys. I love Dumbo – we have garlanded her with a child’s bracelet which happened to come home with us on the same day as we found her. It has metamorphosed with sea growth into something rich and strange. Remember Ariel’s song in Shakespeare’s Tempest? 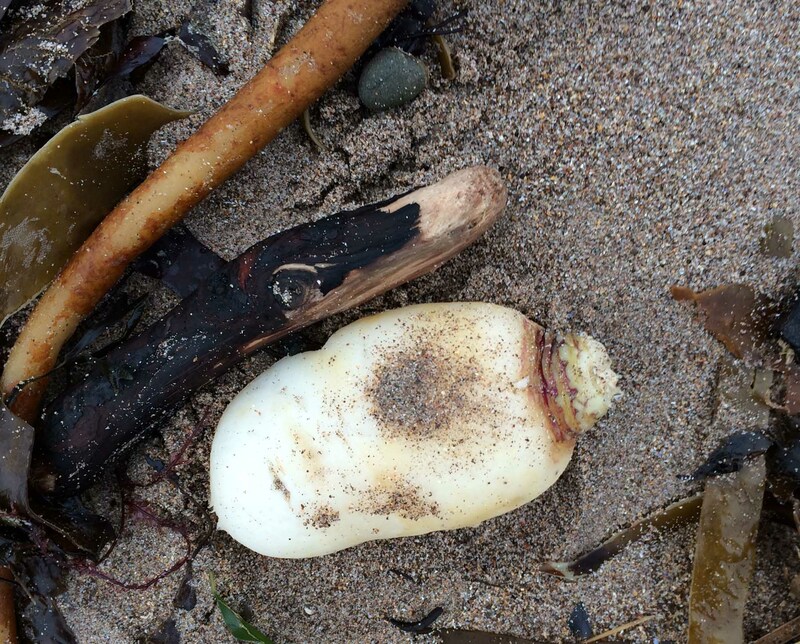 There are sea potatoes and sea urchins … and plastic too. I thought this was a beautiful sea-blue jellyfish when I found it -but it is actually the bottom of a water bottle and only mimics a living creature. How deadly – for all those lost pieces of plastic bottle are being eroded into pellets that sea-creatures ingest. One special Christmas, we found this small china face. It has pride of place now on the window display. 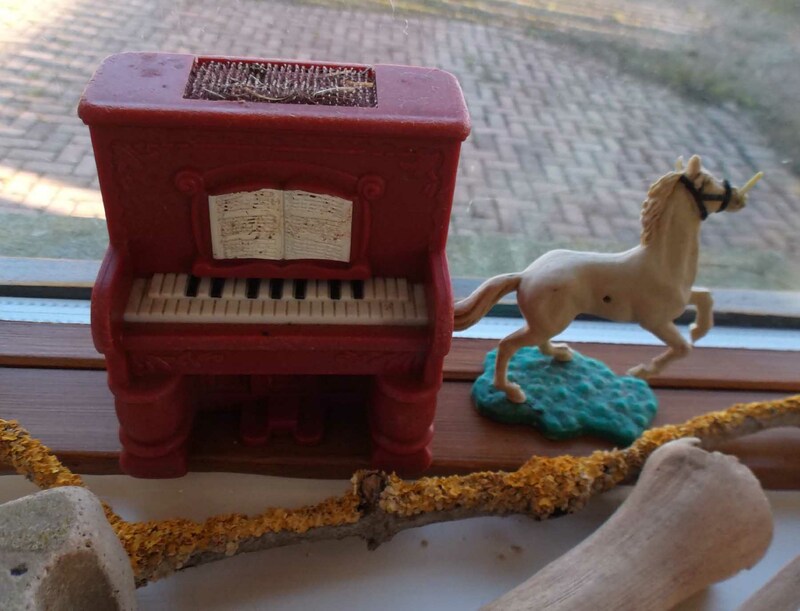 Two other special things share the pride of place spot: our house mouse and the fish skeleton. 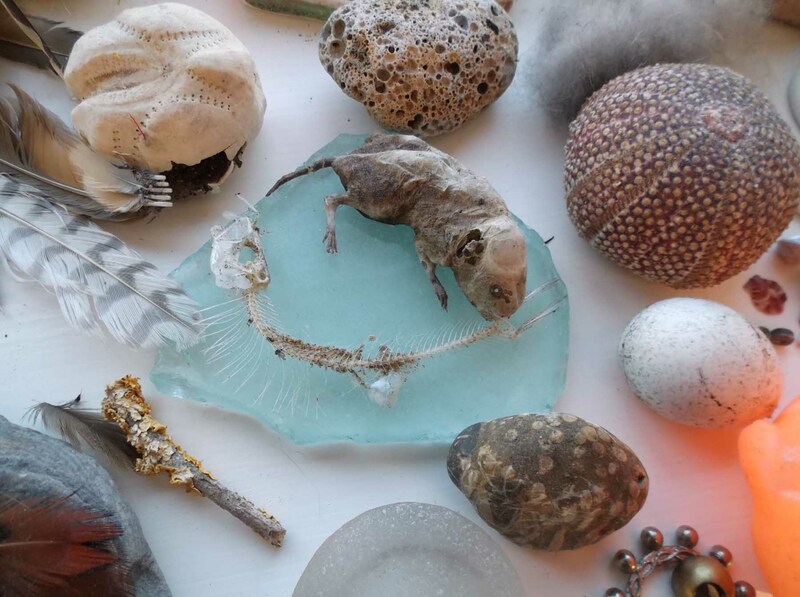 The mouse is not, of course, a sea find. 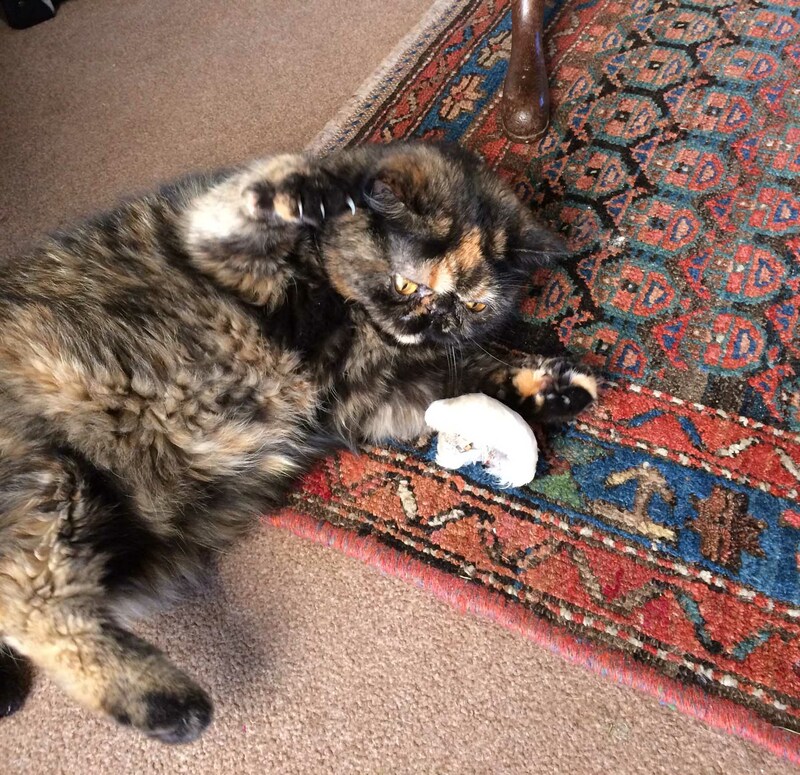 It was brought into our house alive by our elderly cat, Poe, when we first arrived here – and she promptly lost it. Many months later, when moving furniture, we found its desiccated body (why hadn’t it smelt?). Presumably, it had hidden from Poe for so long that it had died of starvation. We placed it here on the window ledge, a small furry creature – and then the moths came by and ate its fur. No respecters of death, they! So here it is, just papery skin, and presumably all internal organs intact. The fish skeleton is such a beauty! Picked clean by bird or fish or the elements, and just look at the curve of that spine! 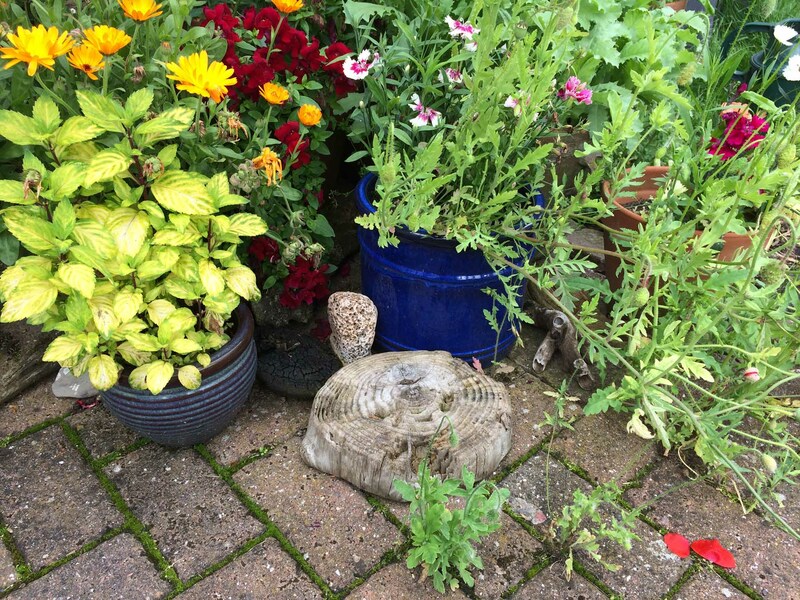 You’ll have realised that all sorts finds their place here. 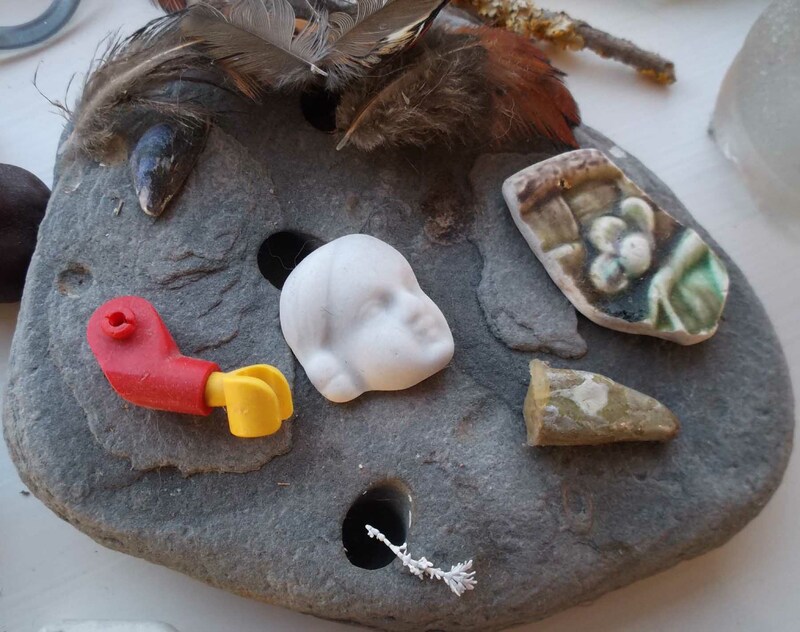 In a humble way, it is our own “cabinet of curiosities”. 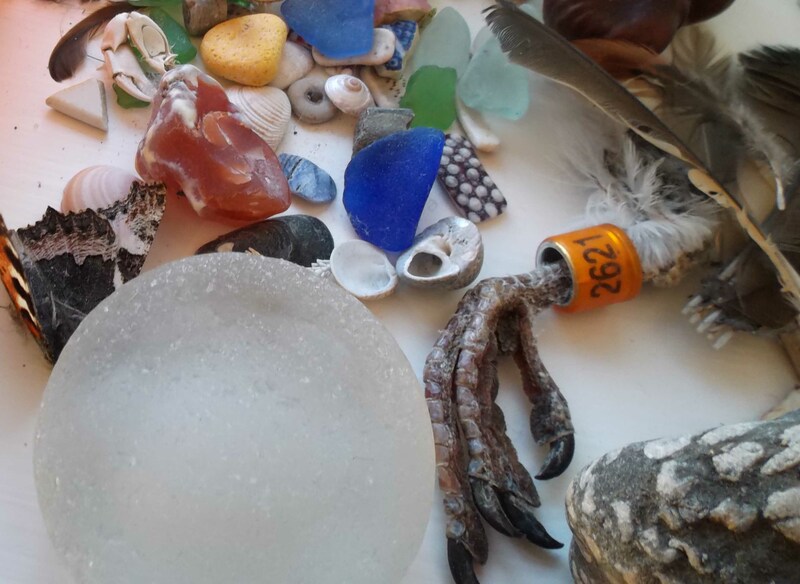 So here are: a pigeon’s claw (still bearing its number), seaglass, feathers, butterflies, shells, cuddy beads (on which more later), glass stoppers, feathers, the pincer of a small crab and fossilised coral. Have you ever played memory games as a child or at a party? These items would be good for that: I packed my portmanteau and in it I put … The trouble is our sea-treasures have spread around the house. 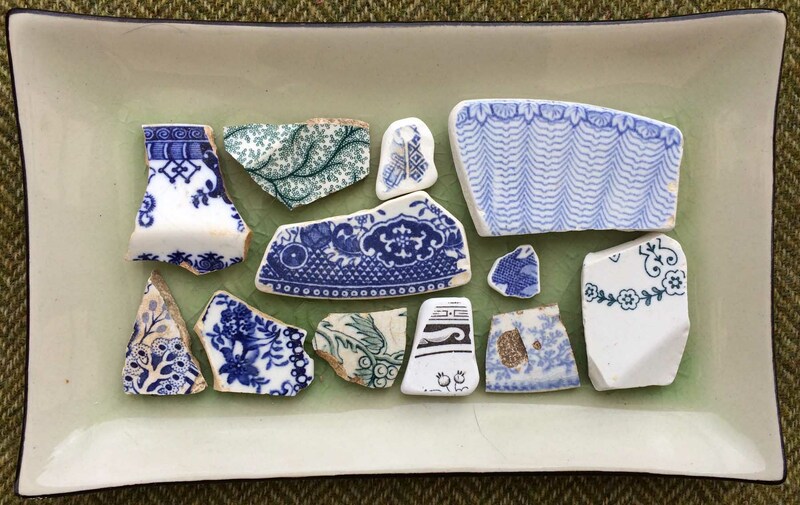 The kitchen table doesn’t only have place mats, conserves and fruit – it’s been taken over with broken china and seaglass. 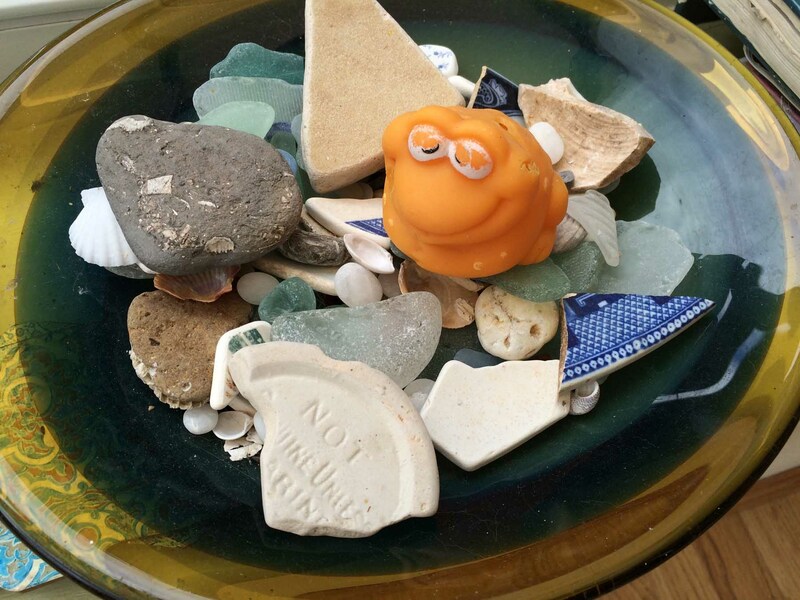 Oh goodness – four bowls of broken China and seaglass! And in the sitting-room, there’s a small oblong tray with a particularly intriguing treasure. We think its the contents of a ready-to-hatch gull’s egg. It would appear that some predator ate the good stuff and left the soft feathery scalp. The cats love it! 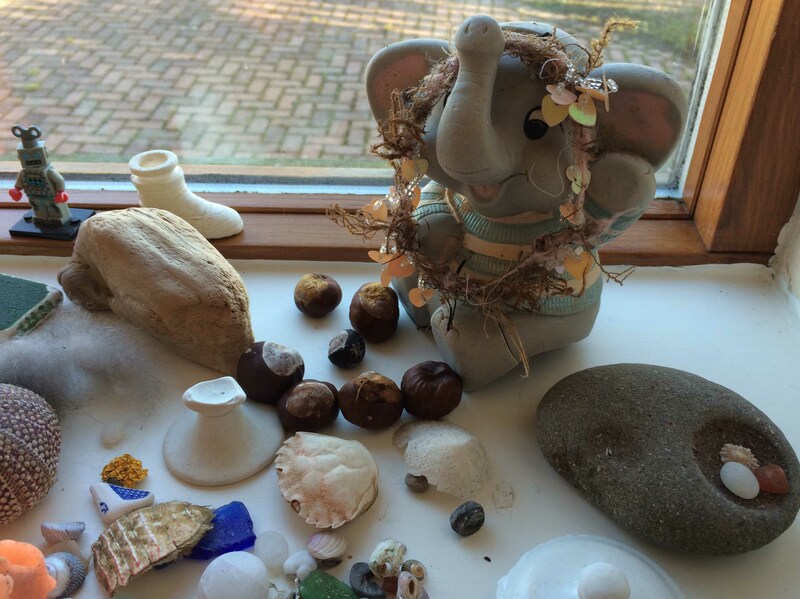 And then in the conservatory – why there are more bowls of sea-treasure! 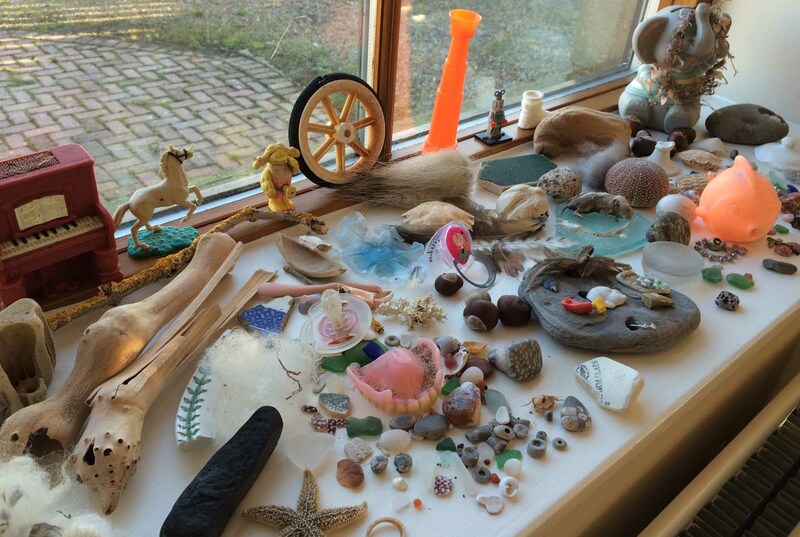 Fossils, toys, old bits of china and seaglass. I particularly love anything we find that has writing on it. Every now and then, it’s fun to play with the finds. To pick out the finely patterned pieces and the lettered ones too. To sort by colour. 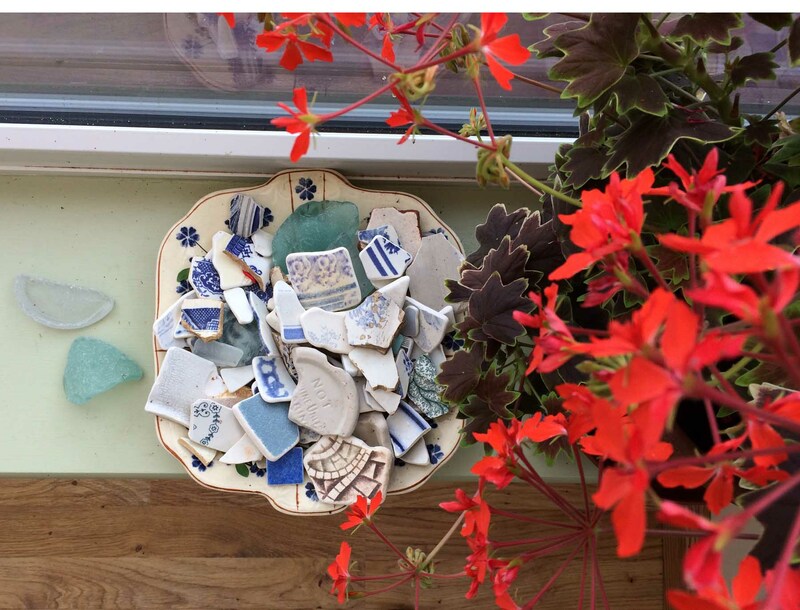 I love the mixture of red-hot geraniums and bowls of old blue and white china. 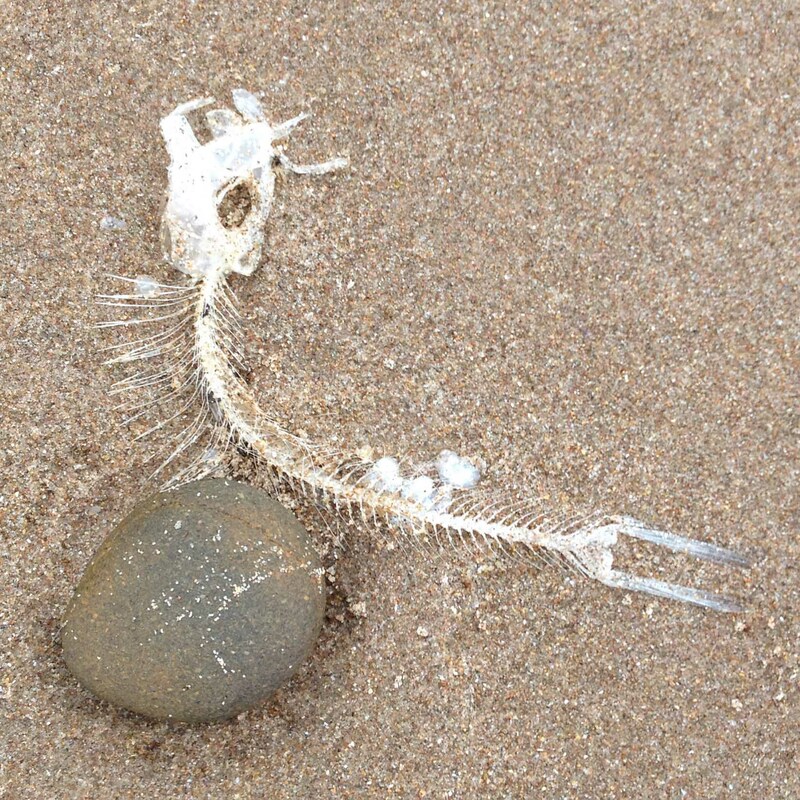 We find a lot of fossils on the beach round here. 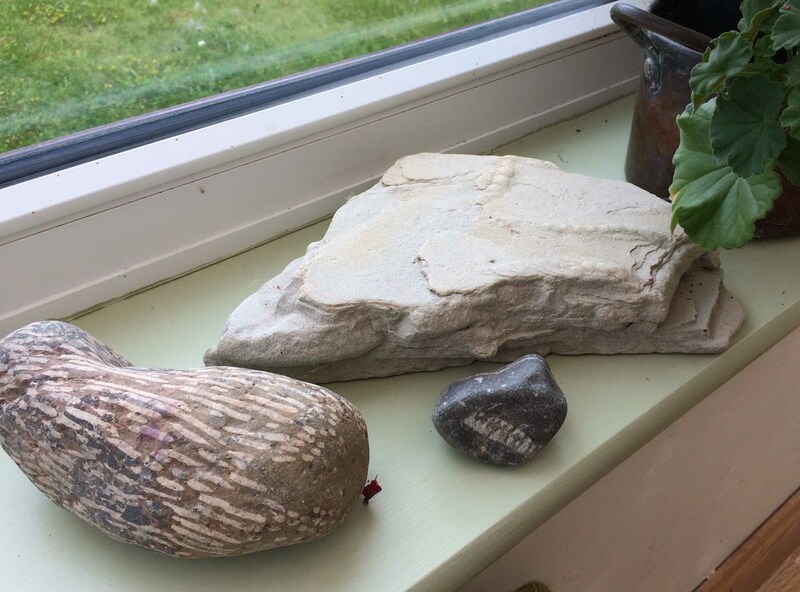 Apparently, there is a fossilised coral reef on these shores and the large streaky stone is a piece from that, nicely rounded by the waves. 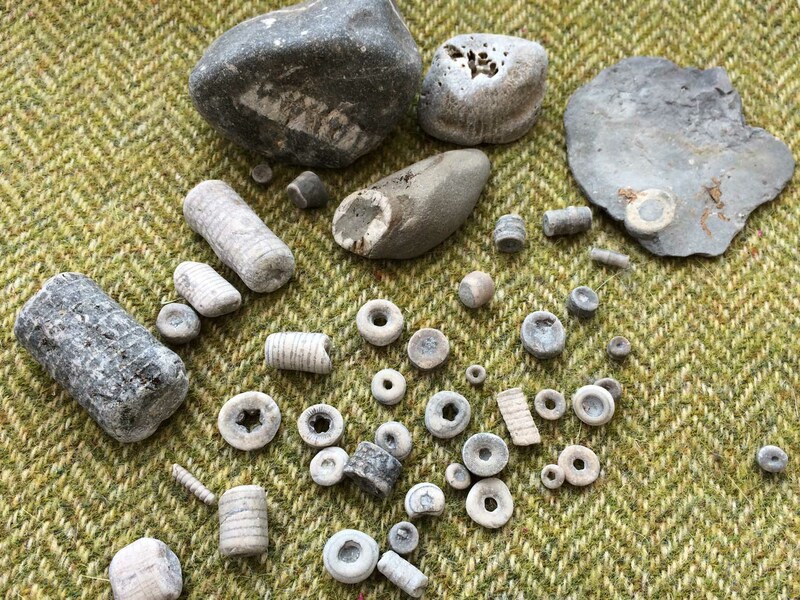 The other pieces are bits we have picked up on nearby Cocklawburn Beach where we find many crinoid fossils. Crinoids (or sea-lilies) were plant-liked animals which inhabited these shores thousands of years ago. Locally, we often find them as ring-shaped segments. They are known as Cuddy Beads after St Cuthbert who lived on the nearby Holy Island of Lindisfarne (Cuddy is the Northumbrian name for Cuthbert). According to legend, Cuthbert himself used these segments to construct rosaries – and others say that later folk around would also use them as rosary beads. So I,m not the only one ! 🙂 …but tell me ..because I,m especially mad about the fossils …is it the Jurassic period where you are ? Thank heavens for the sea: it takes human life, tosses it around, mixes it up, and serves it back up to us in a state less useful than it was before, but much, much more interesting! Yes – such a pleasure to live near the sea and watch its many moods and changes and the effect it has on so much. Good to meet another collector, Daisy Debs! I’m not a geologist so hope I’m giving you the right answer! 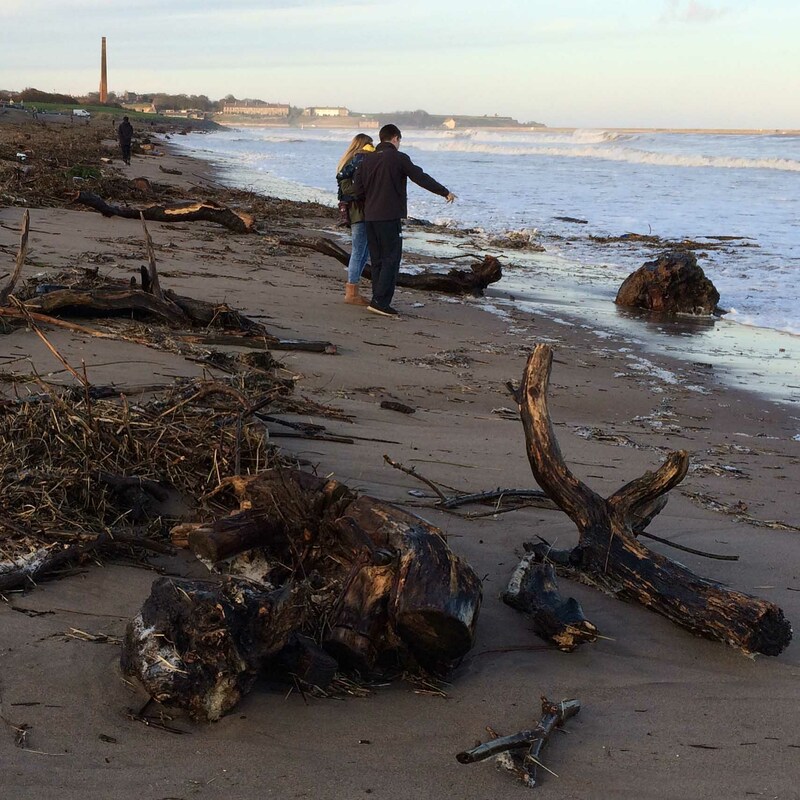 The coast running from Berwick (where we live) down to Newcastle is of the Carboniferous age. Lovely Katherine! It made me wish, not for the first time, that I lived nearer to the sea. I imagine you must occasionally have a clear-out?? Loved the e.e.cummings too, of which I only knew the first two lines. Thank you, Polly! yes, we do have clean outs occasionally – might be due one soon. I also collect less – am much more selective about what I pick up and bring home. You could still move to live closer to the sea … perhaps, one day …? Wow! So many treasures. 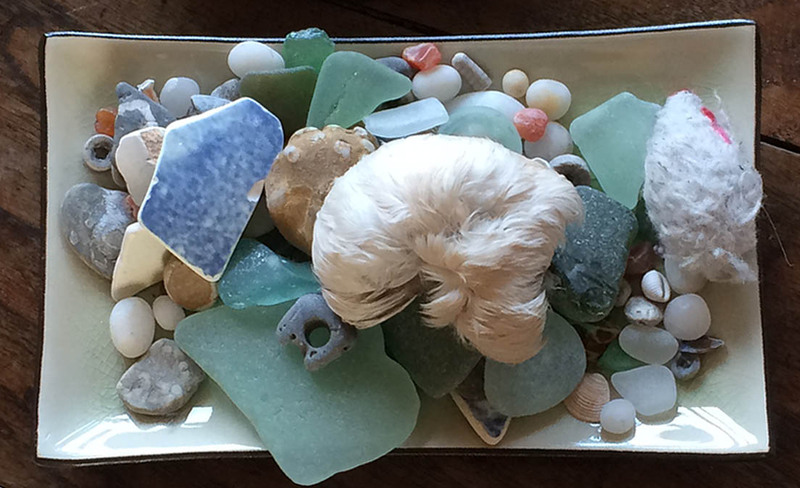 I love beach combing, but have never found such a variety of exciting things. I must visit your nearby beaches sometime. It is magical, isn’t it? We’ve been at it a long time wherefore so much treasure (some might call it junk!). 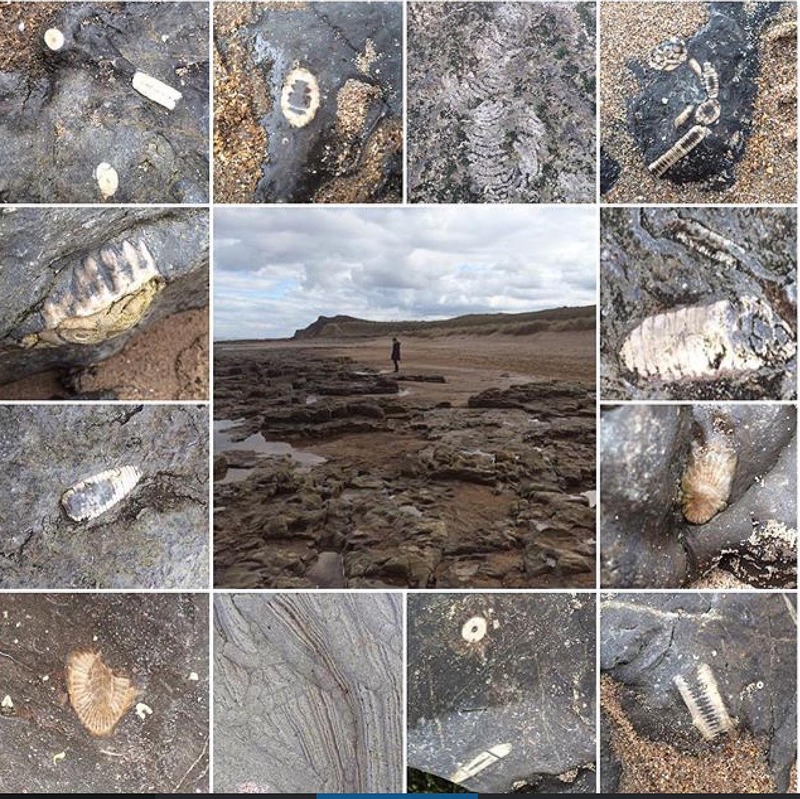 We also live at an interesting spot with the Tweed Estuary particularly affecting what is washed up – and Cocklawburn Beach nearby is a fantastic place for fossils. Love those treasures but not the dead things! My uncle lost his false teeth near Anglesea but found them again. Sadly he also lost his fathers wedding ring and never got it back again. Very bad luck to lose something valuable and sentimental like a wedding ring – I believe quite a lot of people lose jewelry, and sometimes we see people with metal detectors on the beach. The only valuable thing I ever found was a camera, and luckily we found the child who’d lost it after walking up and down the beach for about an hour. I love the china bits! Have you seen when people set the pieces in silver and make jewelry out of it? 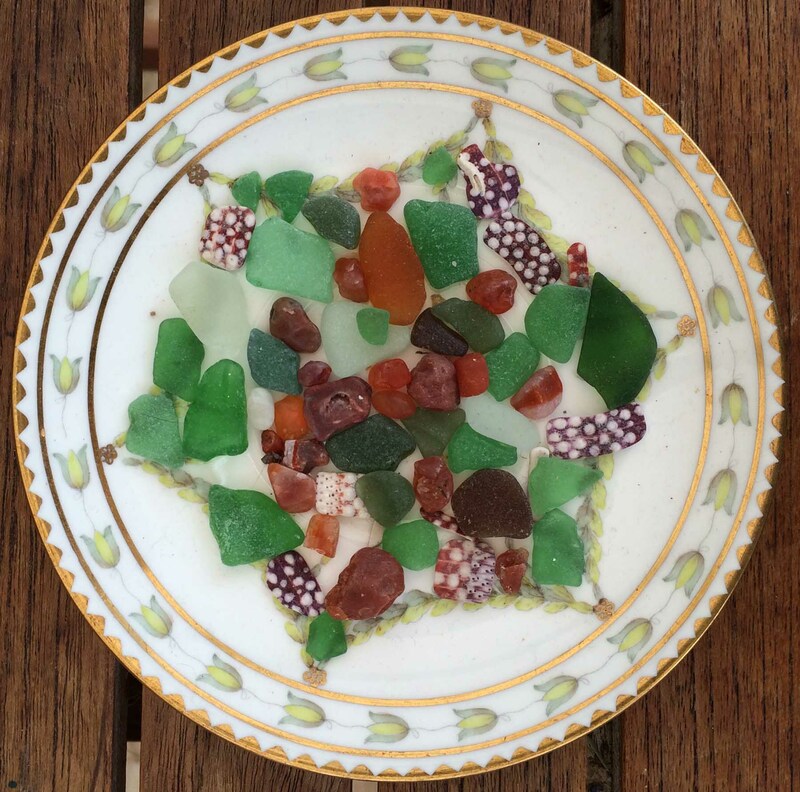 Yes, I love those too – and people set seaglass in silver as well – looks so special like that. 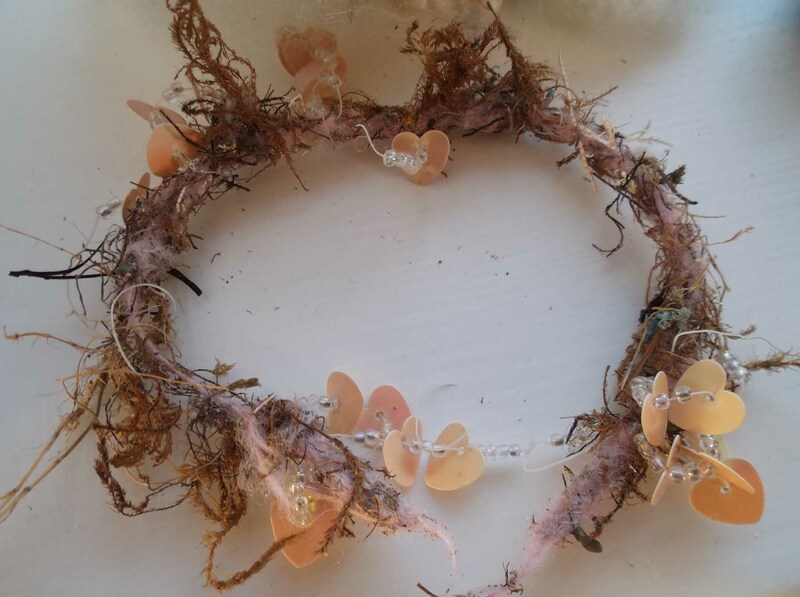 I’d love to be able to do that with my finds – not sure I’ll ever get it together to learn, but there is somebody locally who makes jewellery like that so perhaps one day I’ll take a really special piece to her. How interesting! Do you conjure up stories about some of them? How careless to lose a pushchair and where arethe other halves of the pairs of shoes? Possibly on the side of the road as there seem to be lots abandoned there. 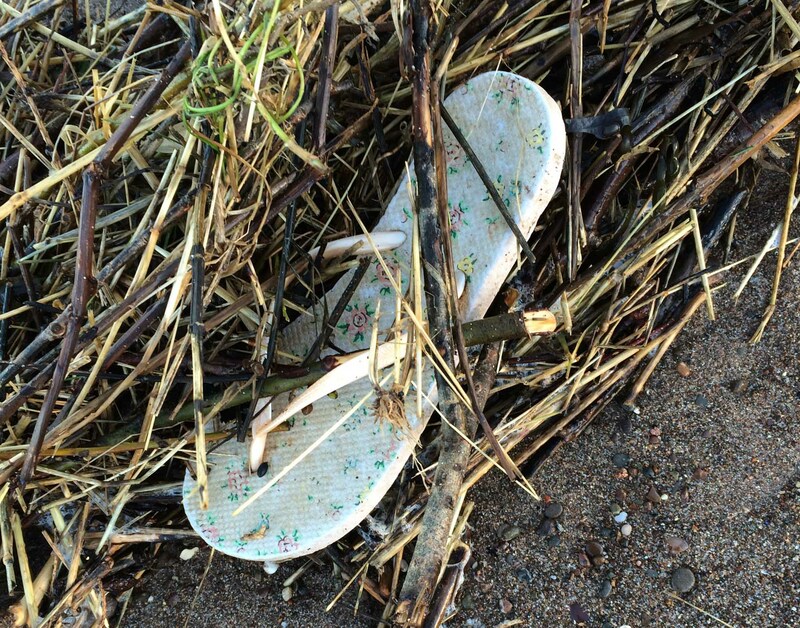 Yes – so much lost – you do wonder … I guess a lot gets washed away with the incoming tide (like footwear) and babies’ dummies probably fall and get dirty – and forgotten. I too am amazed by the rubbish on our roadside verges – can there really be people who coast along in their cars casually chucking stuff out?!! Well, that was a stunner! I am still ‘stunned’ and impressed. I must say I am jealous. I had to move inland 16 years ago and it took me 10 years to acclimate. Seriously it did. I miss the sea terribly, the wind, the rain, the fog, the storms………….great finds you have. Thanks for a look see. Ha ha, you bet I was a dog walker! I had one Wolfhound who drank ‘ton’s of the saltwater and never vomited. Ran in and out of the waves like a mad man. Loved watching that. We were on a beach in a bay and there were never any others there!! 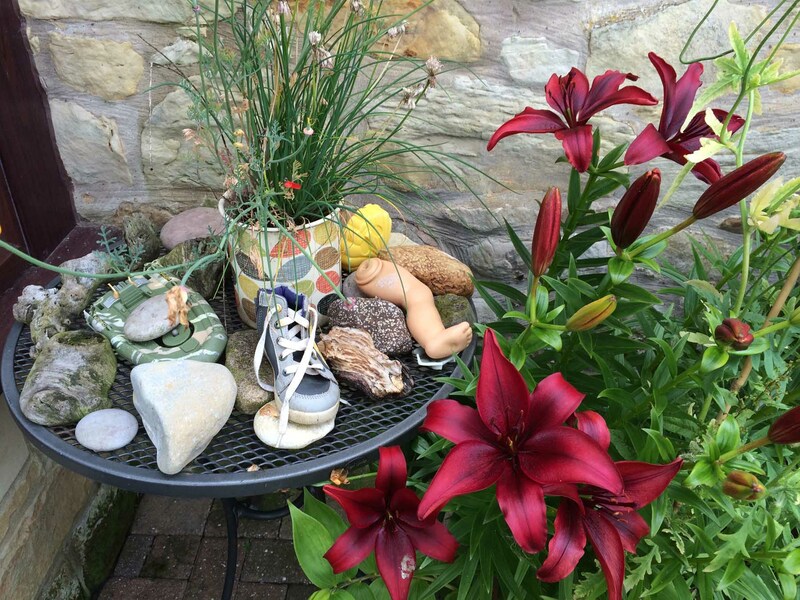 Such interesting treasures you find….and I love the way you find space to display them so lovingly.